This test measures the visual orientation performance for simple structures in a complex environment and is characterized by a high reliability and numerous criterion-related proofs of validity. Diagnostics of the selective attention in the visual area; to be used with adults. Main areas of application: performance-oriented aptitude diagnostics, organizational psychology, traffic psychology, and sport psychology. Special psychological tests are used to check complex dimensions of perception. Most often they were developed on the basis of certain experiment-psychological or practical methods. The present visual pursuit test is not merely a new version of an old test, but rather it was developed out of the experiences and observations with numerous previous versions. The aspect of visual orientation performance is assessed, which consists in pursuing simple visual structures in a relatively complex environment, in a target-oriented way, under time pressure and ignoring distractions. This is why it is also suited for the diagnostics of selective attention in the visual area. The test consists of a combined instruction and practice phase. If the 8 practice items are processed with less than 3 errors, the items of the test phase are presented. The respondents must find the end of a presented line. The respondent can freely choose the working speed. A test form S1 (long form with 80 items) and a test form S2 (short form with 40 items) are available. Scoring is achieved according to the following variables: "Score" and "Mean time correct answers" (sec). The inner consistency is r=0.96 for the long form and r=0.92 for the short form. Studies by Calé (1992), Neuwirth and Karner (2000), and Sommer (2002) are currently available. These show that subjects who perform at a below-average level on the test have more accidents or receive a more unfavourable assessment of their driving ability. Sommer (2002) was also able to show that a test battery that included the LVT correctly predicted 74.7% of global assessments of driving behaviour in a standardised driving test. In addition, groups comparisons are available contrasting the normal population with drivers who had alcohol-related offences (Karner, 2000) and with psychiatric and neurological patients (Neuwirth & Dorfer, 2000). These studies provide clear evidence of the criterion validity of the LVT. Evidence of construct validity is provided by the highly significant correlations between the characteristic values of the LVT and a test based on a similar construct, the ART90 (Karner, 2000), and between the LVT and other tests measuring attention and concentration (Wagner, 1999). 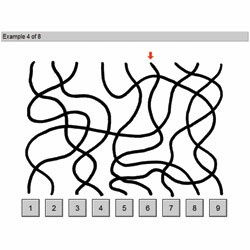 Norm samples of size N=221 to N=785 are available for the three forms of the LVT; some norms are also available separated by age and educational level. For the S2 form the following special norms are also available: norms for drivers with conspicuous behaviour, Portuguese norms for drivers with conspicuous behaviour, and South African norm sample. Measures the visual orientation performance for simple structures in a complex environment and is characterized by a high reliability and numerous criterion-related proofs of validity.